Once upon a time, a handsome, but poor, young Prince called Mark Hughes dreamt of building an Empire called 'Herbalife' where he would be Emperor and where, under his benign rule, there would be endless health, wealth and freedom for all folks - so long as they just kept buying, and swallowing, his exclusive, magic economic, and medical, potions and recruiting others to do the same. Mark's potions could not only make fat folks thinner, and thin folks fatter, but they could also cure sick folks and protect them from all illness whilst transforming the deepest believers into millionaires. Meanwhile, back in the adult world of quantifiable reality. Before-and-after adverts, showing pictures of people who have lost weight or become fitter, feature in thousands of magazines. But how reliable are they, asks Justin Parkinson. Wow, what a transformation. Two volunteers go from looking pale and unfit to tanned, toned and dynamic. Before and after photos show the benefits of a change in lifestyle - eating better, exercising more and, in many cases, taking dietary supplements to help the process along. So how long did it take for the man and woman on the left to turn into those on the right? They volunteered for photos taken as part of BBC Wales's Week In Week Out show investigation into sports supplements. The "regime" consisted of spray-tanning, 15 minutes of light exercise, improved posture and the introduction of more subtle lighting. "I was amazed when I first saw the difference," says Joe, the male volunteer. "We hardly did anything in between. There was hardly any editing of the photos, either. It just goes to show what complete rubbish some of these adverts must be." Physical self-improvement is a long-established business. During the 1940s, weightlifter Charles Atlas advertised his bodybuilding courses by describing himself as a the "97lb weakling who became 'the world's most perfectly developed man'". The pieces often featured stories of how skinny young men on beaches had followed his diktats for a short period, returned and successfully confronted bullies who had kicked sand in their faces. These days, thousands of nutritional supplements are sold with the stated aim of helping people develop their bodies. The industry is worth more than £300m a year in the UK and, with concerns over obesity far higher than during the post-World War Two period, the global weight-loss industry is expected to be worth £220bn by 2017. The basic formula remains the same. "If you're in charge of advertising diet products, body-building supplements or vitamins for a client you'd pretty much get fired if you didn't come up with at least one campaign featuring a before-and-after shot," says Peter Davies, director of the RMS public relations agency. Under EU rules, claims about rapid weight loss or before-and-after photographs which state or imply a rate or amount of weight loss are prohibited, according to a Health Supplements Information Servicespokesman. He adds that there is no specific prohibition against "before-and-after" pictures in relation to muscle gain, but using them to make a claim in relation to a product could be viewed as misleading. A protein product can only ever be marketed as providing the materials for muscle gain that is actually achieved through working out. "One old trick clients used to try was to simply avoid the use of the words 'before' and 'after'," says Davies. "They'd simply print the pictures alongside each other with no text to lead the reader to assume they were 'before-and-after' images." However, the rules have tightened up, he adds, and "anything that misleads the punter will be pulled" by theAdvertising Standards Authority. Could there even be an upside to before-and-after adverts? "You could instantly see the volunteers' confidence growing after they were shown the 'after' pictures," says the photographer Antti Karppinen, who carried out the shoot for Week In Week Out. "They were surprised how much better they looked. It was a boost to them. The ACN scam is one of the biggest "legal" MLM right now and people are falling for it. Be careful out there. Gino - I have clicked on your 'ACN Scam' link and read the text which, although generally critical of 'ACN,' is also inaccurate, ambiguous and potentially dangerous, because it implies that so-called 'MLM' is a legitimate form of business. Normally I wouldn't allow such a link to be posted on my Blog, but in this case, I will make an exception. It is far more accurate to say that 'ACN' is only one part of an ongoing criminogenic phenomenon of historic significance. More than half a century of quantifiable evidence, proves beyond all reasonable doubt that what has become popularly known as 'Network,' or 'Multi-Level, Marketing' is nothing more than an absurd, cultic, economic pseudo-science, and that the impressive-sounding made-up term 'MLM,' is, therefore, part of an extensive, thought-stopping, non-traditional jargon which has been developed, and constantly-repeated, by the instigators, and associates, of various, copy-cat, major, and minor, ongoing organized crime groups (hiding behind labyrinths of legally-registered corporate structures) to shut-down the critical, and evaluative, faculties of victims, and of casual observers, in order to perpetrate, and dissimulate, a series of blame-the-victim closed-market swindles or pyramid scams (dressed up as 'legitimate direct selling income opportunites'), and related advance-fee frauds (dressed up as 'legitimate training and motivation, self-betterment, programs, leads,' etc.). Instead of before and after pictures of bodies, we should show a before and after snapshot of these folks' bank accounts from before and after their involvement in the Herbalife scam. An excellent point Joecool; for the one place you are guaranteed to lose weight in the 'Herbalife' racket, is from your wallet. There are millions of Herbalife photos on the Net that are prohibited by EU Rules! You make it sound like a protection racket. That's because so-called 'MLM' is only a more-sophisticated version of a protection racket. 'MLM' racketeers don't point a gun at their victims' heads, but they do offer them an illusion of doom (outside the group) or salvation (inside the group), but (just as in the classic protection racket) victims have to keep paying the racketeers. Anonymous - The problem here is that wealthy criminogenic groups like 'Herbalife,' have not been subject to the rule of law for decades. Their bosses have organized mystifying labyrinths of apparently independent corporate structures which have isolated them from liability. Back in the 1980s, 'Herbalife' agreed to pay $850 000 and was ordered to stop making any medical claims whatsoever for its products by a California court, on pain of immediate closure. In other words, the court found that 'Herbalife' had been peddling a form of counterfeit (and potentially lethal) medicine, but this order has never been enforced. Yet a mountain of quantifiable evidence proves that 'Herbalife' shills have been driving a coach and horses through this court order and that deluded 'Herbalife' core-adherents invariably believe that 'Herbalife' products can cure people of, or protect them from, almost any known human illness. Some of the claims that have been made for 'Herbalife' wampum are totally absurd. Various women have been filmed insisting that 'Herbalife' products have enabled them to fall pregnant. Obviously, these fraudulent images also imply that if you stop regularly buying and ingesting 'Herbalife' products, you will return to your previous imperfect state and even die. 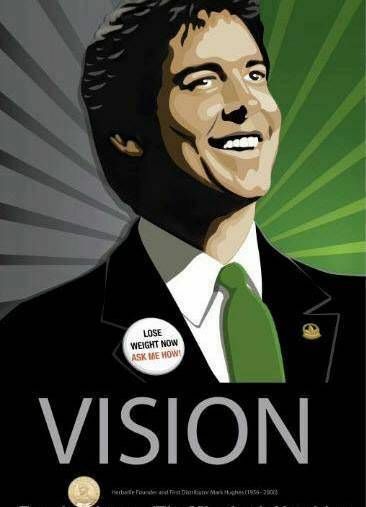 I just watched the Herbalife Opportunity video above (directly below the 'Vision' pic). Of course it is this 'business opportunity' that Herbalife is really selling. Much like Scientology recruitment, it begins by describing the 'rot' in people's lives, the much worn script of those experiencing the work-a-day world and the dead end nature of their Job and how their efforts always seem to fail to provide the financial success of the wealthy. The first half of the video is the 'before' and the end describes the incredible success of the 'after.' This of course is the real scenario of how Herbalife (and nearly all MLM's) are really marketed. It lends itself to the message that anyone can follow the prescribed methods and generate thousands of dollars in profits in just the first month. Of course we know these are basically 'fairy tales' spun to attract those who find themselves in similar states of job 'rot'. quixtarisacult - Down the centuries, just like a mousetrap, the basic design for the cultic human trap has remained the same, but the bait has been constantly updated to fit the spirit of the times. 'Nutrilite / Multi Level Marketing' and 'Scientology/Dianetics,' were initially designed to ensnare alienated, and/or traumatized, WWII veterans. Both these all-American rackets offered their prey a fake, ultimately-incomprehensible, 'step-by-step,' pay through the nose system to transform from ordinary humans into superhumans. 'Dianetics' and 'MLM' victims were told to duplicate exactly the 'positive' example of higher-initiates and to believe that they had to remove all 'negativity' from their minds and bodies. In other words, by offering them an attractive reward of a future secure Utopian existence, ill-informed individuals were robbed whilst being cut-off from external reality and tricked into a position of subservience and blind obedience. The video which I posted, is an almost perfect example of how the 'negative vs positive' cultic 'income opportunity' bait has lately been presented - complete with exemplary superhuman shills in their Ferraris, Porsches and Bentleys. If you watch it again, take note of the doom vs salvation, before and after music, Neuro Linguistic Programming and imagery, all linked with a short dehumanizing clip of a rat trapped on a treadmill. I would actually say that human beings are becoming increasingly gullible, because human beings are becoming increasingly certain that they are far more clever than previous generations. All con-artists know that the easiest people to fool, are persons who are certain that they cannot be fooled, and that once they are fooled, their egoes will keep them fooled. I've often believed that many people have been conditioned to believe the unbelievable by the claims made by religion? The reality inverting nature of faith lends itself a perfect fit for MLM. Amway is touted as a 'god' inspired business whose enemies are inspired by Satan himself. I suppose it isn't a far stretch to go from believing in the virgin birth and the burning bush to believing the thought stopping myth of MLM. Where does 'religion' end and fraud begin? History demonstrates that human beings can be persuaded to believe in almost anything provided it's labelled 'religion'. That said, people should be free to believe in whatever they want. e.g. If they want to believe in 'Unicorns' that's perfectly OK. However, if some charlatan takes that apparently-harmless belief, and starts to sell its adherents 'shares in a company producing canned Unicorn meat,' then that's fraud. In truth, all non-rational ritual belief systems (a.k.a. 'religions') can be easily perverted for the hidden purpose of human exploitation. The US Constitution contains the word 'religion,' but its authors failed to state exactly what they meant. Presumeably, they meant any non-rational ritual belief system which has not been instigated, and/or perverted, for the clandestine purpose of human exploitation. I agree. Scientology, now a recognized religion, can mask violations of human rights under the auspices of the operation of monasteries; essentially concentration camps, cult prisoners in the 'hold' of the good Ship Hubbard. Sea Org members (who signed billion year contracts) might endure serving time in the RPF workhouse. They experience demotion to slave, given exhausting work, and are virtually isolated and driven to mind numbing drum beat of Hubbard tech. The minds of the Sea Org are molded in the crucible of isolation, exhaustion and submission to 'sec-check' interrogations (auditing) by a crude lie detector, considered a 'sacred artifact' of the church, the e-meter. Scientology has instilled states of insanity into the minds of the vulnerable and then 'treated' these by locking them in rooms where no medical attention was offered or given. In some instances cult members were made sick and allowed to die. A victim of Hubbard technology formulated by the minds of an insane liar, a madman. Yes, there are significant crimes associated with Scientology and by Scientology. Some committed by Hubbard, the many committed by others. That being said, there have been significant crimes committed by nearly all world religions to include the many cult and heretical spin-offs. The execution of heretics and infidels as well as the excommunication of others is the hallmark of religion, the sins of the select. Religion deserves little respect. It indeed 'poisons everything' as the now deceased author Christopher Hitchens revealed in his book 'god is not Great.' The crimes of Islam are essentially just as insidious as the Judea Christian faiths. Believers of the unbelievable are and can be drawn into cults like Scientology, Amway, Herbalife or the misery of other aspiring MLM charlatans presenting themselves as messiah. quixtarisacult - I think that L. Ron Hubbard proved that it's quite easy to plagiarize the essential dualistic scenario which controls the minds and behaviour of all committed adherents of traditional religions. Christopher Hitchens was a man with a large mind and a large thirst, but he had a tendency to forget that the great strength of totalitarianism, is that its opponents are often obliged to adopt its tactics. I agree that religions, and religious leaders, in general do not deserve respect, but there are many traditional religious believers who do deserve a lot of respect. Hitchens tended to forget that as well. Christopher Hitchens was quite fond of George Orwell, as your are and I am as well. I am sure that if Mr Hitchens had lived to see the more recent scandal revealed by NSA whistle blower Edward Snowden, he would have had much to say on the topic of Big Brother. Even so, I believe Hitchens knew that the attacks of 911 and the subsequent knee jerk reactions of the Patriot Act were in a sense a degradation of the rights of man, that under the banner of 'good' the free society would be reined in by totalitarian surveillance methods and that in a sense the right to privacy would be nearly completely usurped for the good of the state. In the name of 'homeland security' (very much an Orwellian concept) all become enemies of the state. The farming of information easily lends itself to the frightening compilation of 'lists.' This in so many ways is more a more insidious evasion of privacy than that of the Communist 'witch' trials headed by Joseph McCarthy in the 1950s. Imagine if every citizen of the world can in a sense be 'sec-checked' by a 'Google' like system. Type in the word 'totalitarian' and a long list of individuals who had used the term would appear. Then type in the 'NSA' to further shorten the list. In this type of whittling down, an 'enemies' list can be sifted out. From that list you can imagine certain individuals who's doors might be busted down in a 'round up' of enemies of the state, or enemies of the system? Do you suggest that the enemies of totalitarianism are then totalitarian them self? Isn't this a 'chilling effect'? quixtarisacult - There are plenty of people around the world, including the USA, who have long-since realized that, although America turned up late for the first two World Wars, since 1945, your leaders have been obliged to go along with the populist idea that, if you are ready and willing to turn up early for the next one, then the next one will never arrive. Unfortunately, but inevitably, America has become an increasingly self-righteous country which has steadfastly presented itself as a heroic saviour - a beacon of freedom and democracy, etc. protecting and encouraging freedom and democracy, etc., around the world. However, this Hollywood-style 'good guys vs bad guys' scenario has progressively been used by the leaders of USA, and their 'security' advisers, as a false justification to prosecute preemptive wars and to take away individuals' freedom. Eric Blair, aka George Orwell, is credited with writing the most profound allegory of totalitarianism dressed up as 'Communism,' but I would say that, in 'Animal Farm,' he also produced a universal allegory of totalistic cultism. In truth, totalitarianism, or totalism, is enduring, but its camouflage is ephemeral, and history proves that totalitarianism is at its most dangerous when it goes largely-unrecognized. Orwell's final book, 'Nineteen Eighty Four,' showed what would be the ultimate result of unrecognized totalitarianism - a nightmare world where fiction was universally seen as fact and fact was universally seen as fiction. With a perfect sense of irony, both 'Animal Farm (a Fairy Story)' and 'Nineteen Eighty Four,' were fact presented as fiction. A while ago, I formed the conclusion that cults are embryonic totalitarian regimes, but few cult instigators manage to gain control of entire countries and become full-blown totalitarian dictators. The reason for this, is because it's usually only at times of mass-alienation and fear (following defeat in war, during economic depressions, etc.) that otherwise mediocre, narcissistic charlatans come along peddling essentially the same old fiction of a future secure Utopian existence (as fact), and get widely-mistaken for authentic saviours. "A while ago, I formed the conclusion that cults are embryonic totalitarian regimes, but few cult instigators manage to gain control of entire countries and become full-blown totalitarian dictators." Interesting enough, L. Ron Hubbard had just those aspirations to control a country. During his sea fairing days at the helm of his 'rust bucket' navy and when he wasn't engaged in the folly of having his crew searching for treasure he claimed to have buried during a past life, he made futile attempts to 'invade' and inject his 'technology' into small tumultuous nations, and take control. At one point he became author of what he hoped would become the constitution of Rhodesia. Later, after grounding his pitiful navy in the U.S. he launched operation 'snow white' where Scientology operatives infiltrated the offices of the U.S. Government to supposedly purge and alter files that threatened his legacy and future of Scientology. How far this incursion went relied upon the extent of its success, which ultimately failed. Hubbard's failures at least prove his intentions. Cults do not necessarily have to take over a country, as long as they can maintain just enough power to get what they want. We can see this in Amway founder Richard DeVos who has turned money into significant political influence. In so many ways, Amway and Scientology have already completed their bloodless coup of the world. Why should they buy the cow when the milk can be had for free? It is to the shame of those nations that permit a foreign criminal agency to establish a base of operations from which their own inhabitants may be exploited. Like a parasite, cults only need fear being pulled off of their host. Messiah's aspire to the position of tyrant. In space, little black holes aspires to be a massive black holes. We are witness to what the little black hole of Nazism eventually became. Isn't Scientology's goal to 'clear' the entire world? This supports your your point. Herbalife's monopoly control of information is unraveling. May the black hole of Herbalife explode! quixtarisacult - Hubbard took took to the high seas in the 1960s, because he was being pursued by a long list of law enforcement agencies in Europe and the USA. By this stage, Hubbard was a megalomaniacal psychopath living in (and peddling) a paranoid comic-book fantasy in which only he, and his followers, were enlightened good guys and everyone else was a deluded bad guy controlled by invisible evil extra-terrestrials. Hubbard was quite literally prosecuting a form of war against the rest of humanity, and he created his very own Navy (using stolen funds) for that paranoid purpose. There is a huge amount of irony in the fact that Hubbard hatched a plot to take over Rhodesia at a time when the country would unilaterally withdraw from the British Commonwealth in an attempt to preserve minority white rule. Today, Rhodesia is Zimbabwe - a failed state ruled (since the demise of minority white rule) by Robert Mugabe who latterly has become a megalomaniacal dictator. Rhodesia was originally created by Cecil Rhodes, and, for a while, L. Ron Hubbard believed that he was Cecil Rhodes, or rather that L. Ron Hubbard and Cecil Rhodes were both merely temporary human containers for the same extraterrestrial spirit - a Saviour of Galaxies who (down the centuries) had kept transferring from one human container to another.